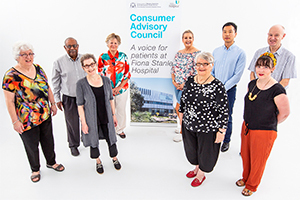 Fiona Stanley Hospital (FSH) is committed to partnering with consumers to ensure a patient-centred approach to service delivery and to ensure that the consumer voice is heard, acknowledged and valued. The FSH Consumer Advisory Council (CAC) includes consumer, carer and community members. The CAC provides support and advice to our hospital to improve the hospital experience for patients, their families and other hospital consumers. facilitating communication and cooperation between our hospital, local service providers and the community. The CAC values feedback from the community and can be contacted via email FSHFeedback@health.wa.gov.au or phone 6152 4013. The Fiona Stanley Hospital CAC meets monthly. If you would like to register your interest to become a CAC member, please contact the Patient and Family Liaison Service on 6152 4013 or complete our Expression of Interest form (Word 72KB) and email to FSHFeedback@health.wa.gov.au. Our Consumer E-Network is a group of consumers interested in partnership and participation and helps the hospital by reviewing patient publications.